Settlements created in Michigan, Illinois, Wisconsin and Iowa by citizens from the Netherlands. Holland, Michigan, platted as a Village. A "Tract of Land" donated by the Rev. A.C. Van Raalte, later known as "The Five Acres" and designated as a site for the academy. The Pioneer School, the first educational institution in the new settlement, formally opened on The Five Acres in October. The General Synod of the Reformed Church in America assumed control of the school. Van Vleck Hall erected on The Five Acres. The Five Acres enlarged to 16 acres and designated the college campus. The first freshman class, 10 in number, matriculated, September. Philip Phelps, Jr. elected first president of Hope College; inaugurated, July 12, 1866. Charter of Incorporation as a College of Liberal Arts granted by the State of Michigan, May 14. First Commencement of Hope College, July 17. The Rev. A.C. Van Raalte died, November 7. Giles Mandeville begins service as provisional president of Hope College. Charles Scott begins service as provisional president of Hope College. Elected Hope's second president in 1885; inaugurated, June 21, 1886. Construction started on the President's Home (completed in 1892). Graves Library and Winants Chapel cornerstone laid October 12; dedicated, June 26, 1894. Gerrit J. Kollen elected third president of Hope College; inaugurated, June 27, 1894. Van Raalte Memorial Hall dedicated, September (destroyed by fire April 28, 1980). Carnegie Gymnasium dedicated, June (renamed Carnegie-Schouten Gymnasium in 1954; razed in July, 1982). Elizabeth R. Voorhees Girls Residence dedicated, June. Ame Vennema 1879 elected fourth president of Hope College; inaugurated, February 19, 1912. Edward D. Dimnent elected fifth president of Hope College; inaugurated, May 14, 1919. The Memorial Chapel dedicated, June (renamed Dimnent Memorial Chapel in 1959). The building features beautiful stained glass windows. Wynand Wichers elected sixth president of Hope College; inaugurated, October 12, 1931. Hope Preparatory School, originally the Pioneer School, discontinued. Science Building (later Lubbers Hall) formally opened, September 16. Irwin J. Lubbers ’17 elected seventh president of Hope College; begins, Summer, 1945. Formal opening of Winifred Hackley Durfee Hall, residence hall for women, September 26. Music Hall completed (named for the late John B. Nykerk in 1962); razed 2015. Kollen Hall opened (dedicated, September 1, 1957). Van Zoeren Library opened September (dedicated, October 8; renamed Van Zoeren Hall in 1988). Calvin A. VanderWerf ’37 elected eighth president of Hope College; inaugurated, November 16, 1963. Physics Mathematics Hall opened September (renamed VanderWerf Hall of Physics and Mathematics, October 9, 1981). Brumler House for apartment living dedicated, September 28. William Vander Lugt begins service as chancellor of Hope College (until 1972). Wynand Wichers addition to Nykerk Hall of Music dedicated, October 25; razed 2015. DeWitt Student and Cultural Center opened, September; main theatre renovated, 1996–97. Gordon J. Van Wylen elected ninth president of Hope College; inaugurated, October 13, 1972. Peale Science Center opened, August. Major renovation completed, summer, 2004. Dow Health and Physical Education Center opened, August. College East Apartments opened, August. DePree Art Center and gallery, a former furniture factory, dedicated, October 15. The 118th Commencement ceremony conducted at Holland Municipal Stadium, the first Commencement held outdoors in Hope's history, May 8. Maas Student and Conference Center constructed. John H. Jacobson, Jr., elected 10th president of Hope College; inaugurated, October 10, 1987. Van Wylen Library dedicated, April 21. The Holland Theatre downtown donated to the college and renamed and reopened by Hope as the Knickerbocker Theatre. College Guest House at 85 E. 10th Street opened, September; renamed the Keppel Guest House, March 29, 1992; becomes Campus Ministries office, summer, 1994; moved to 129 E. 10th Street, August 16, 1995. Van Andel Plaza dedicated, August 17. Paul G. Fried International Center dedicated, September 22; International Education moves to the Martha Miller Center for Global Communication, summer 2005. Van Zoeren/VanderWerf renovation and DeWitt Center for Economics Business dedicated, October 12. The track and field facilities at the Ekdal J. Buys athletic complex are named in honor of Gordon Brewer ’48, April 27. Lugers Fieldhouse dedicated, September 28. Six-court, indoor DeWitt Tennis Center dedicated, October 14. 78-84 E. Eighth St. and 100 E. Eighth St. purchased, announced October 2. The 100 E is building named Anderson-Werkman Financial Center in honor of staff members William K. Anderson and Barry L. Werkman, May, 2005. Statue of the Rev. A.C. Van Raalte dedicated at Centennial Park as part of the city's sesquicentennial celebration, May 1. Haworth Inn and Conference Center completed, January; dedicated, May 22. Cook Hall dedicated, October 17. James E. Bultman ’63 elected the 11th president of Hope College; inaugurated, October 22, 1999. Addition to Nykerk Hall of Music provides space for an organ studio; organ dedicated, October 6, 2000; razed 2015. Three racquetball courts in the Dow Center transformed into a weight room and fitness room; the former weight room becomes a dance studio; summer. Dykstra Hall renovated during the summer. The new science center, connected to the west side of the Peale Science Center, opens for use with the start of the school year. Major renovation completed of the Peale Science Center, summer; dedication for the science center, October 8. Entire facility named in honor of Dr. A. Paul Schaap '67, May 5, 2006. The Martha Miller Center for Global Communication opens. The Richard and Helen DeVos Fieldhouse opens. Both basketball teams go undefeated in their first season in the $22 million facility. An addition to Cook Hall is completed. A $3 million renovation of historic Lubbers Hall is completed. Historic Skinner organ in Dimnent Memorial Chapel rededicated following restoration, January 30, 2007. Baseball and softball fields renovated and stadiums built and named, respectively, in honor of Ronald ’60 and Sunny Boeve, and Karla Hoesch ’73 Wolters and Tom Wolters ’73. A $5.7 million adaptive restoration of Graves Hall is completed. Building is rededicated on October 9, 2009. Hope constructs the $5.3 million Van Andel Soccer Stadium. 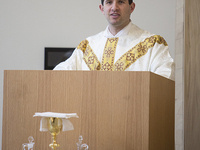 Facility is dedicated on October 17, 2009. Renovation of VanderWerf and Van Zoeren halls adds and enhances multiple research laboratories in engineering and physics. The 12-court, outdoor VandePoel-Heeringa Stadium Courts open on June 4, 2012, and are dedicated on September 22, 2012. Hope renovates Holland Municipal Stadium, which opened in 1979, during the summer in anticipation of purchasing the stadium from the City of Holland later in the year. The college renames the stadium for Ray and Sue Smith in January 2013. The Tom and Ryan Cook Village, a four-building complex providing up-scale housing for 60 students, is completed during the summer. The Haworth Engineering Center, a three-level, 9,000-square-foot wing added to VanderWerf Hall, is completed. Building is dedicated on September 6, 2013. John C. Knapp elected the 12th president of Hope College; inaugurated, October 4, 2013. The Phelps Hall dining hall reopens for the start of the 2014–15 school year following an extensive two-year renovation. The 64,000-square-foot Jack H. Miller Center for the Musical Arts, the new home to the Department of Music, opens in August for the start of the 2015–16 school year, with the main Concert Hall premiering with the Musical Showcase concert on February 5 and 6, 2016. The center is built for a total project cost of $35 million, which includes construction and an endowment for maintenance. The Kruizenga Art Museum opens on September 9 with the exhibition "Past Present East West: Highlights from the Permanent Collection." Built for a total project cost of $7.8 million, including construction and an operating endowment, the facility includes galleries of 1,500 square feet and 2,000 square feet. Hope marks its sesquicentennial across the 2015–16 school year, leading to the anniversary of having received its Charter of Incorporation as a College of Liberal Arts from the State of Michigan on May 14, 1866. The 42,000-square-foot Jim and Martie Bultman Student Center will open in August for the start of the 2017–18 school year. Connected to the DeWitt Student and Cultural Center, the facility is built for a total project cost of approximately $22.5 million, which includes the new construction, related renovation of DeWitt and an operating endowment. Two townhouse style apartments housing eight students each are added to the Cook Village and will open for the start of the 2o17–18 school year, built for a total project cost of approximately $1.8 million.